As an outreach student ambassador, I sometimes get opportunities to work with young people who hope to go on to study a creative subject at university. I really enjoy working at these events, and sometimes I get to join in with their projects or create work of my own. The latest job - working at a Creative Media Camp run by Canon and the Ideas Foundation - was a great opportunity for me to learn and practice whilst working and helping out. The project they were given was to make a video and create a brand identity/agency in groups. These videos were based on one of Canon's sustainable development goals, such as poverty, health and sustainable cities. Canon were hoping that these videos would have the potential to go viral and spread the messages the students were trying to convey. My job as an ambassador was to support the students with technical help and ideas, as well as showing them what it was like to study at UAL. Throughout the week, in addition to helping the students, I also got a chance to develop my skills in photography and film making. I learned more about using a DSLR camera, which will definitely help me with my work in the future. I also got the opportunity to make some films for Canon and the Ideas Foundation. I was asked to make a few videos throughout the week, which I really enjoyed doing! I made a video showing some behind the scenes footage of the Creative Media Camp, along with two other UAL ambassadors. It was great to be able to show everyone our video at the Canon HQ after the students had all presented to the panel, as it showed how everyone had worked well together and progressed throughout the week. It is also something that the students can look back on, and the Ideas Foundation can use to promote their Creative Media Camps for the future. The other two videos I made were more related to Canon. One of the directors of the charity Ideas Foundation, which helps young people from all backgrounds get involved in the creative industries, spoke to me about their work with brands like Canon. She explained that as a charity, they rely on money from Canon and other brands to keep working. Therefore she asked me to make a video that the charity could present to Canon, in the hope that it would persuade them to donate more money so that the charity can achieve more and more going into the future. This video was fairly difficult to make, because I was asked to film an interview with one of the staff helping out at the camp, and I ended up having to cut a 13 minute interview down to create a 1 minute video! However I really enjoyed making this one, and it really helped me to practice using the cameras and editing using Adobe Premiere Pro. 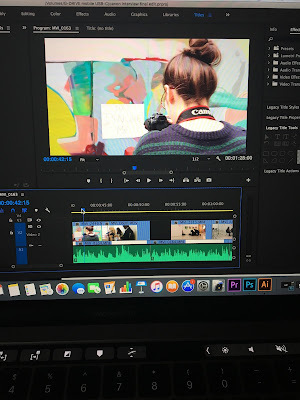 I did most of the editing and filming on this video, which meant that I got to make all of the creative decisions and film extra footage to show on top of the interview, whereas the behind the scenes video was more of a joint effort. I even got to teach one of the other ambassadors how to edit, which was fun because she will be able to use those skills on her course. Overall, I really enjoyed the week. Not only did I get to work with young creative people with great ideas and talent, but I also got to develop my creative skills in terms of filming and editing. I also got the chance to make some connections, such as meeting photographer/visual storyteller Simeon Quarrie and working with lots of skilled professionals, such as animators and photographers. I also spoke with Ideas Foundation about internships and freelance opportunities that they get sent, which may be suitable for me in the future!